« PISSARRO’S PLACES in Madrid! Camille Pissarro did not paint bouquets of flowers very often, but those he created are masterful. This one, featured in the PISSARRO exhibition in Barcelona, is a real treasure. Six pale pink roses, stand in a crystal vase, fully open and almost ready to drop their petals. The pale pink is highlighted with a creamy white that gives the flowers an inner glow. The vase sits on the lower level of a highly-polished chest. In the background, two paintings hang on the wall, but it is unclear whether they are Pissarro’s work. The one on the left hangs a little crooked and appears to include mountains. Could it be a Cezanne? Pissarro must have made this painting in the spring of 1902, because in May he donated it to a sale at the Drouot auction house benefiting the widow of an artist friend. Since he was always very specific in the names of paintings, we wonder about this one which clearly indicates that the pink roses are from Nice. At that time, Pissarro and his family were living in Paris on the Ile-de-la-Cité in an apartment facing Pont Neuf. The flowers may have come from Le Marché aux Fleurs, the flower market that has supplied flowers to the neighborhood since 1808. While the market probably had roses in early spring (there are always roses in flower shops in Paris), would Pissarro have known where they were from? Would he have bought them or would Julie have picked them up during her shopping trip? When I saw this painting with Robert Froh, an American artist living in Barcelona, he suggested a more interesting idea. Perhaps they were brought to the Pissarro family from Nice by Henri Matisse, who was living in Nice in 1902. Pissarro met Matisse at Durand-Ruel’s gallery in Paris in 1897. According to Pissarro; Critical Catalogue (2005), “Though he never worked with Pissarro, Matisse benefited from his advice, found in him an attentive teacher and came under his influence for awhile.” Matisse visited Pissarro at his apartment on Rue de Rivoli and watched him create his paintings of the Tuileries gardens (Pissarro: His Life and Work, 1980). So it is entirely possible that he came to Paris to visit Pissarro, bringing roses from Nice as a gift. 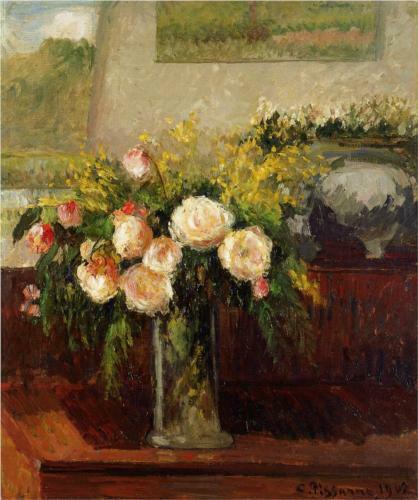 And it obviously pleased Pissarro to remember those roses in this lovely painting. The PISSARRO exhibition will be on view at the CaixaForum in Barcelona until mid-January. PISSARRO’S PLACES is available at the CaixaForum and also at the Excellence bookstore during the exhibition.